At two side events at the United Nation’s High Level Political Forum (HLPF) held between 9-10 July 2018 in New York, SPACES FOR CHANGE | S4C presented the findings of its multi-year research that examined the impacts of LPG, kerosene and gasoline subsidy reform on women and the poor in Bangladesh, India and Nigeria. S4C conducted this multi-year study in collaboration with the Global Subsidies Initiative managed by the International Institute for Sustainable Development | IISD under the auspices of the ENERGIA Gender and Energy Research Programme, funded by DFID. The research built empirical evidence to support gender approaches to be an enabler not only for reaching universal access to energy, but also for poverty reduction and overall sustainable development. HLPF is the central platform of the United Nations to follow up and review the 2030 Agenda of the Sustainable Development Goals. SDG 7, which seeks to ‘ensure universal access to affordable electricity by 2030 is among the goals reviewed at this year’s Forum with the theme, ‘’transformation towards sustainable and resilient societies”. 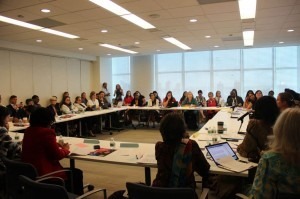 The ENERGIA International Network on Gender and Sustainable Energy, in collaboration with the Department for International Development (DFID) hosted the side event with the aim of informing the ministerial and multi-stakeholder dialogues at the HLPF with evidence and lessons on the interlinkages between SDG 5 on gender and women empowerment and SDG 7 on energy; and more specifically on the impacts of energy access on women and girls and why taking a gender approach leads to better outcomes. The research focused on Nigeria, India, Bangladesh and Indonesia. All four countries have gender equality gaps. They are also subsidizers of fossil fuels and are reforming their energy subsidy policies. The research is based on household surveys and focus-group discussions undertaken in Bangladesh, India and Nigeria, and a review of secondary data across all three countries, including Indonesia, which focused on the gender impacts of LPG and kerosene fuel subsidies and their reform. Overall, 2,442 household surveys were conducted across the three countries: 630 in Bangladesh, 1000 in Nigeria and 812 in India. In Nigeria, household data surveys and focus group discussions were conducted in Lagos and Imo states. The survey in Lagos was conducted in two urban slums; Badia-East and Ebutte-Metta while the Imo survey was conducted in 6 rural villages in Uzoagba community, in Ikeduru Local Government Area. Survey data was collected from individual respondents in residential and commercial buildings in the selected sampling units. Additional data was also collected from groups of respondents in focus group discussions (FGD) involving 56 women in Lagos and 27 in Imo. How do the changes in kerosene (and petrol) subsidy policies affect the welfare, productivity and empowerment of women in low-income? How might the welfare, productivity and empowerment of women and girls in low-income households change as a result of policy reforms? With the evidence collected across the three countries, the study found that fossil fuel subsidies were not working well for women. Despite subsidizing petroleum products like premium motor spirit (PMS) and household kerosene (HHK), a large number of households do not purchase them at government-subsidized rates. This is because the subsidies are not directly targeted to low-income households, with women making up the majority of those on low incomes. Low-income women not benefiting from subsidies as they depend heavily on informal vendors and therefore, not procuring their fuels at the subsidized rates). This means that the low-income women pay much higher prices than the official sales price, especially for HHK. To reverse this trend, better targeting of fuel subsidies is needed to support low-income households, and especially women. One way to target subsidies effectively is by reallocating or reinvesting subsidy savings on the education of women and girls. Research evidence established a link between education and access to cleaner energy. The Nigeria survey found that the highest proportional use of biomass fuel (firewood and charcoal) was observed among respondents without any form of education while those with tertiary and post-graduate education record zero use of biomass fuel. On the other hand, respondents with tertiary and post-graduate education have the highest proportional use of cleaner energy such as LPG while those with no education record limited use of clean fuels. Therefore, better targeting of subsidies to poor women through investment in maternal care, education (for women and girls) or loans for women-led businesses are very key to achieving improvements in women’s income and facilitate shifts from traditional biomass to cleaner energy. Other effective targeting approaches include investments in energy-saving appliances or renewable energy lighting that enable women spend less time on drudgery and have more time for productive economic activities which will more disposable income for advancing their families’ priorities. In places like Nigeria where petroleum distribution is not yet effective, there is need to strengthen distribution systems especially in rural areas to improve access to subsidized fuels. Subsidy reform also needs to specifically address concerns about making fuel available and accessible in quantities preferred by low-income. This is one single factor heightening preference for informal vendors where fuels can be purchased according to size and means of the consumer. India presents a best practice example of targeting subsidies both directly to low-income women and towards cleaner energy products like LPG. India introduced the Pradhan Mantri Ujjwala Yojana (PMUY) scheme with the aim of providing 50 million LPG connections to women from poor households expand their access to clean energy. PMUY assists poor households by absorbing the capital cost of acquiring an LPG connection, which act as a barrier to LPG adoption. Under this scheme, PMUY households receive a “connection” subsidy (for the purchase and set up of LPG equipment including the security deposit, equipment cost of regulator, hosepipe and other installation charges) in addition to the subsidized LPG cylinder. The PMUY connection subsidy is paid only to women via their bank accounts. To benefit from the scheme, the beneficiaries were expected to have a bank account, a national identity document, a poverty card and a mobile phone. The criteria for identifying the low-income eligible for the scheme is based on India’s Socioeconomic Caste Census 2011 which classified certain women as Below the Poverty Line (BPL). Apart from the health and time benefits of using cleaner fuels, the beneficiaries of the scheme experienced greater decision-making on choice of cooking fuels and increased financial inclusion with women having bank accounts. The lessons from India demonstrate how countries around the world are encouraging shifts in cooking away from biomass and kerosene towards cleaner cooking fuels and appliances—such as electricity and gas. Another important finding of the survey is that subsidy reform needs to be undertaken with care, taking into account the local context and traditional gender roles. If not taken with care, high energy prices associated with reforms increase dependence and switching back to old fuels, defeating official efforts to heighten transition to cleaner fuels, including renewable energy. Reforming subsidies—whether by outright removal or reduction of the subsidies—on petroleum products lead to higher fuel prices. In Nigeria, the household surveys identified that coping mechanisms for the increase in kerosene price differed between geographical areas. Households in urban areas did not switch to other fuels but reduced their kerosene consumption, increased expenditure on fuels, or saved money by reducing expenditure on other goods. In rural areas, households seem to be unable or unwilling to increase their financial expenditure on fuel. They reduced their kerosene consumption, or switched to other fuels, most likely firewood. Subsidy is however, not the only element that leads to fuel switching and better access. Other factors that the research found include affordability – also distribution, taste and culture and freely available wood. During the focus group discussions in Nigeria, a number of women shared that food cooked with firewood tastes better than food cooked with other energy sources. Some women indicated preference for biomass fuels because of the the taste associated with firewood-cooked meals. The side event brought together a high-level panel of researchers from different countries who also presented the empirical findings from their research and the policy implication and recommendations relevant for the achieving SDG 7. Other presentations at the side event include the Impact of Energy Service Delivery on Women Businesses in the Informal Food Sector (South Africa, Senegal, Rwanda), by Jiska de Groot, University of Cape Town, South Africa; and Gender and the political Economy of Energy Sector Dynamics (India Nepal), Govind Kelkar, M.S. Swaminathan Research Foundation, India. The messages based on the new evidence from across countries highlighted the benefits of energy access for women and on involving women in energy supply. The resulting lessons also recommended the optimisation of gender approaches towards more inclusive outcomes for both men and women.